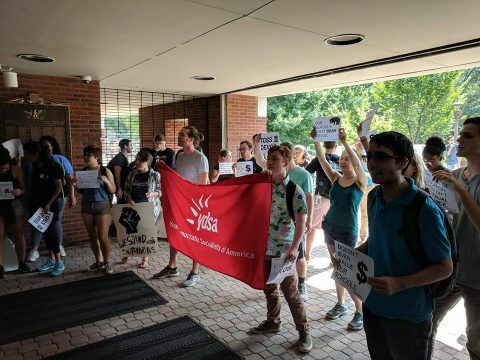 Congratulations to the near 50 comrades and allies from College Democrats of Ga Tech who, with only two hours notice [on 10/3], teamed up [with Ga Tech YDSA] to fight back against privatization, austerity, and corruption, and to demand #CollegeForAll! We won’t be seeing Betsy DeVos on campus again for a long time. Good riddance! She has protected rapists at the expense of survivors of sexual assault. She has enriched her personal friends and family at the expense of students and the public. She has stoked imperialist war from which her family personally benefits. She has worked to defund public schools instead of giving our teachers fair salaries. Students are right to be angry at her and all who collaborate with her as she wages a class war on behalf of the ruling billionaire class against the public. It is our right to voice our anger and to fight back. We exercised that right today, and we will continue to do so until the needs of the real Georgia Tech community, and students across this country, are addressed. YDSA will never step down in our calls to enact College For All, to forgive student debt, and to decommodify education. It is inspiring to see so many students come out to demand a world for the many, not the few. YDSA GT stands in solidarity with survivors of sexual assault, with our fellow students in public schools and universities across the country, and with the working class majority.